The development of the 4 door sedan was already well advanced when the development started on design of the Coupés and Convertibles. It was a logical step to think that these new cars should share the mechanical elements of their top of the range sedan brothers and sisters, just as their predecessors, the Ponton Coupés and Convertibles did. There was no question of shortening the floorpan of the sedans because Daimler-Benz management decided that a five-seat capacity would have a much greater appeal, the previous Ponton Coupés and Convertibles were, just as the 300S models, two seaters (perhaps you could fit a third person in the back of a 300S but I wouldn't recommend it). The first design sketches by paul Bracq were drawn up in 1957. They looked little different from the sedans, the only real difference was the lack of rear doors, they still had very prominent 'fins'on the back and the front windscreen showed the American influence once again. These things all dissapeard when the design studies went on. 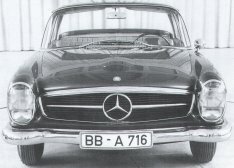 Later design studies showed a 300SL type grille which made the Coupé look rather sportier. 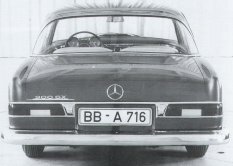 Other studies showed rear lights that were similar to the ones found on the sedans but this also dissapeared, giving the Coupé a unique and different look while hiding its family bond they had with the sedans. The Lichteinheiten or combined headlights were the only distinct reminder of that bond.